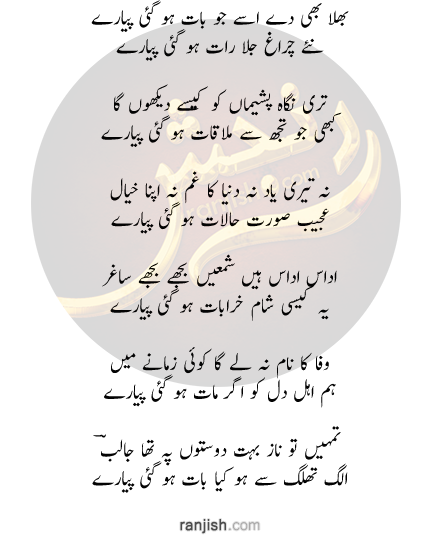 Ranjish.com has lots of Urdu Habib Jalib Poetry. Feel free to add your own Habib Jalib Shayari here. 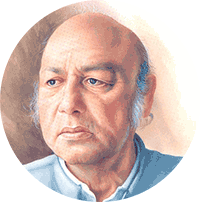 Habib Jalib was a revolutionary poet of Urdu language. He was known for his anti-establishment poetry. He died in 1993 in Lahore city. Habib Jalib wrote 9 poetry books in total. Ranjish.com is the ultimate place to read Habib Jalib Poetry. Kahin aah ban ke lab per tera naam aa na jaye..
Jo tamaam zindagi hai woh nizaam aa na jaye..
Yeh aur baat teri gali main na ayen hum..
Jaalib chalo kahin se usey dhoond ke layen hum..
We update our poetry database on daily basis so keep coming back for more Habib Jalib.